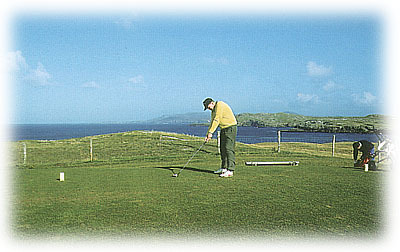 Dunfanaghy Golf Club is a favourite spot for golfers with its views of the beach, sea and Horn Head. Club and trolley hire available. Practice facilities and light hot snack bar on site. This is a popular spot for golfers, situated on the shores of Sheephaven Bay, the course offers magnificent scenic views. Here one can pit themselves against the wind, the beach, the rivers and the rough, not to mention the occasional treacherous bunker. Why has no one posted a comment about this course since 2004? Great wee course the back turn, 7th, 8th, 9th and tenth are to die for. Elevated tees looking over the Atlantic. The par 3 6th is also elevated and in high winds you do need a driver and it still isn't reachable!! A great par 5 16th hole and tricky but not difficult 18th finishes, what is a great round of golf. Friendily? Very friendly. Last year the club captain bought our whole society (21 people) a drink. How much more welcoming is that? My favourite course anywhere. I've played this course in beautiful summer sunshine and in a howling gale and enjoyed it hugely every time. Great fun with fantastic views. My brother in law is a member so we play most days when we visit. Some fantastic elevated tees which make for some easy tee shots, as long as the wind is with you but be prepared to get out your driver on some par threes if it's against you. This links course is fantastic, breath taking views and an extremely friendly clubhouse are just two of its good points. The golf, ah now just let your concentration slip here for a second and the rugged but beautiful Donegal terrain will have you thanking your lucky stars that its only par 66. I play here every year when on holiday and the course is always in top condition. For anyone visiting this part of the country with the need for a very enjoyable challenge then Dunfanaghy is it. It's not huge, but it can test anyone. I play this course every year and each year it gets better. Although the land is flat, they have made the best of local features such as rivers and beaches, which cut into the course. 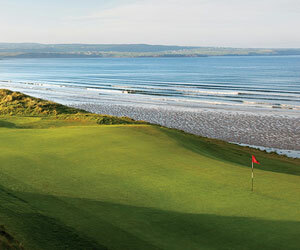 I played early in the season at Dunfanaghy and experienced the best greens for the time of year. will be back again, sure!!!!!!!!!!!!!!!! Played the course summer 1998.Had a rubbish round but enjoyed it immensely. A lovely course, especially the 17th.